The Auphonic Recorder is a high-quality audio recorder with focus on ease of use, audio quality and stability. In combination with the integrated Auphonic Web Service, it’s possible to post process, encode, tag and publish your podcasts, interviews, music recordings on the go with a single click. 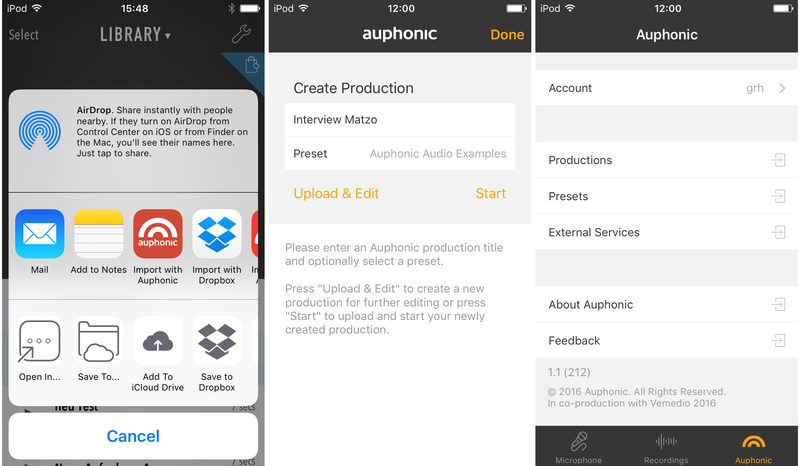 The Auphonic Recorder includes no audio editor as implemented in Auphonic Edit for Android. 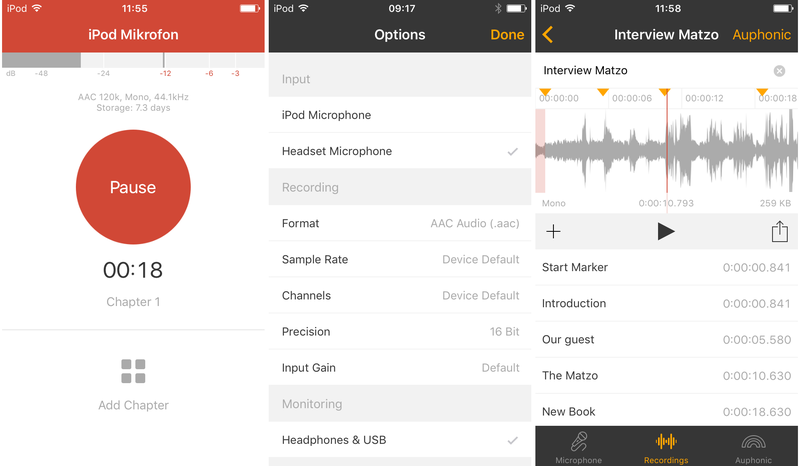 But you can use any other iOS audio editor and share the results with our App to export mobile audio from iOS to our Web Service! The recording interface displays the current maximum peak level, available recording time (storage), you can add and edit Chapter Markers and it’s possible to record in background while the screen is turned off. The recorded signal is encoded in an uncompressed PCM (.caf) or compressed AAC format (Mono: 120kbps, Stereo: 160kbps), written to disk every audio buffer so that no data loss happens if the app gets killed. You can choose the recording Samplerate (44.1kHz, 48kHz or device default), Mono/Stereo and set the recording Precision/bit depth (16bit or 24bit). It’s possible to lower the microphone Input Gain, if the recorded signal is too loud (peak level display is very high) or produces Clipping. Note that our default input gain setting is automatically adapted for various microphone types and should work in most situations. Activate Monitoring to hear the audio signal during recording with headphones. For our compressed AAC format, we don’t use an MP4/M4A container, because it might get corrupted in the case of a crash. We use the AAC ADTS format to always write a valid audio stream, even if the app gets killed. In the Waveform View it’s possible to set start and stop markers (cuts start/end of your audio), to set metadata, Chapter Marks and to export and process the audio file using the Auphonic Web Service or share it with other iOS apps. You can import recordings from other iOS audio apps using the Share Sheet/Open In functionality. For example, you might use Ferrite or Garage Band to cut and mix your recordings, then export it to Auphonic to upload and process it with our Web Service. Upload audio files, including Metadata and Chapter Marks, in the background directly from iOS to our web service. Select one of your Presets to perform audio post processing (loudness, leveling, noise reduction - see Audio Algorithms), Encoding/Tagging, Speech Recognition and trigger Publishing with one click directly from your phone. Click on the Share Button in the Waveform View (below the waveform) to share the audio recording with any other iOS app or to send it per email.